The Calling, Live at the Mall of Asia Arena! ISN’T it a bummer when you attend a concert and you don’t know anything about the songs being sung on the gig? Even in the concerts of those popular foreign artists, who have a hit or two, concert goers find themselves bobbing their heads to songs they don’t even know. That is about to change now. Subterranean Ideas Entertainment is bringing “The Calling, Live at the Mall of Asia Arena!” for the first time ever on Nov. 11, 2016, making it, hands down, the biggest rock concert of the year. Its vocalist/songwriter Alex Band is one of the most successful singer/songwriters in the new millennium and he is fresh from the studio doing new songs. Band, actually, has never left the scene as he embarked on a successful solo career in Los Angeles, California where he is based. 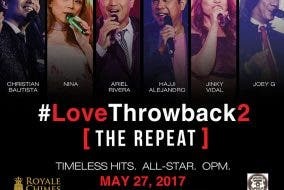 This year, in an engagement special only to the Philippines, Band and his rock cohorts are bound to capture everyone’s hearts once again in a one-night concert backed by Smart, New World Manila Bay Hotel, Red Fox, Wish 107.5, Eurotel, WhenInManila.com, DeVant, Philippine Star, Philippine Daily Inquirer, Business Mirror, Home Radio, United Neon, Sprinto, McVitie’s, Go Ahead, Odyssey, Pulp Magazine, Philippine Concerts, Manila Concert Scene, Nanogen, Village Connect and Bren Media. The Calling will be singing their countless hits such as Adrienne, Stigmatized, Could It Be Any Harder, Things Will Go My Way, Our Lives, Anything, Why Don’t You and I?, For You (theme song of the movie DareDevil), Tonight, Euphoria, Only One, and the mega-hit song Wherever You Will Go, dubbed by Billboard 100 as the Song of the Decade and is the No. 3 Greatest Adult Pop Song of All Time. In youtube, the song boasts of 150 million hits and counting, not to mention its hundreds of iterations, covers and other related video content. In the Philippines, it is a staple in almost all videoke renditions, a song young and old alike, may have sung in their lifetime a countless times. Adrienneand the mega-hit song Wherever You Will GoAnythingCould It Be Any HardereuphoriaFor You (theme song of the movie DareDevil)only oneOur LivesStigmatizedThe Calling Live!Things Will Go My WayTonightWhy Don’t You and I?